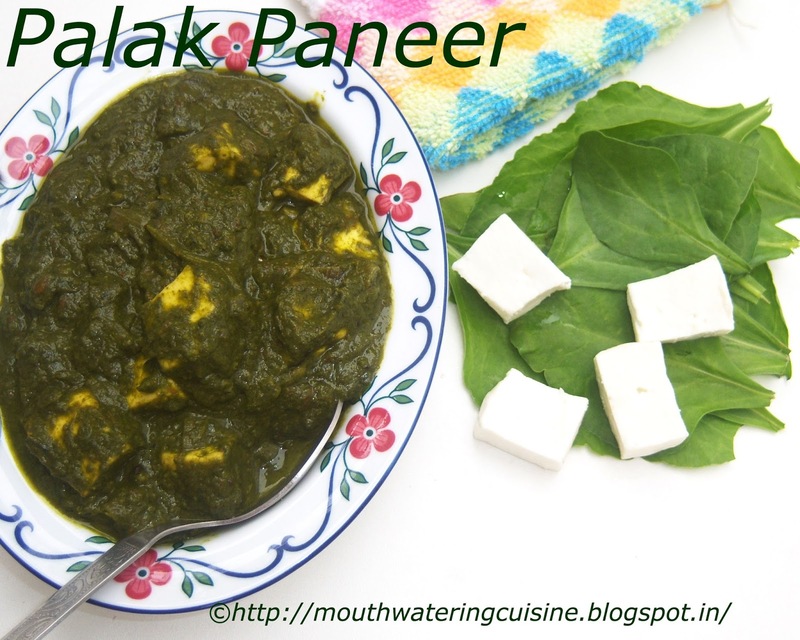 As a South Indian I like some of North Indian dishes, among them palak paneer is one. I have made paneer last week, we cannot store it for more than two days. So to make the best use of it I made this dish. 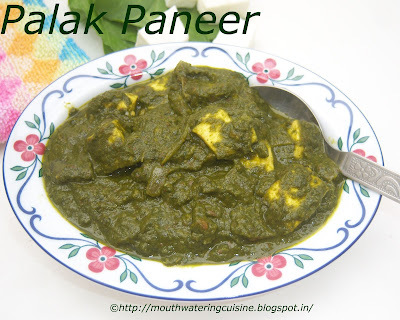 It is made with paneer cooked with palak or spinach puree and added condiments. Serve it with roti, naan and also with jeera rice. Wash palak and blanch it in boiling water. Drain excess water and allow it to cool. Make a fine paste of it. Chop onion and tomatoes. Slit green chillies. Cut paneer also in cubical. Heat oil/ghee in a thick bottoem kadai, add cloves and cinnamon sticks. Once they start spluttering add chopped onions and green chillies. Once onions turn translucent add tomatoes. Fry them till they become mushy. Add salt, turmeric powder, garam masala, red chilli powder and coriander powder. Allow this to cook for a while, say two minutes. Add pureed palak to it. Mix well. Once palak puree started boiling add cubed paneer to it and allow this to cook for five minutes. Once palak is added, do not over cook. Serve palak paneer with roti, naan or with jeera rice.